Unlike health apps that require users to look up food items, log calories, or record activity, the Am I Hungry? Mindful Eating Virtual Coach is a powerful decision-making tool using an “inside-out” approach to eating and physical activity. PHOENIX - May 8, 2015 - PRLog -- Am I Hungry?® Mindful Eating Programs and Training is pleased to announce that the Am I Hungry? Mindful Eating Virtual Coach App is now available for iPhone, iPad, and Android. 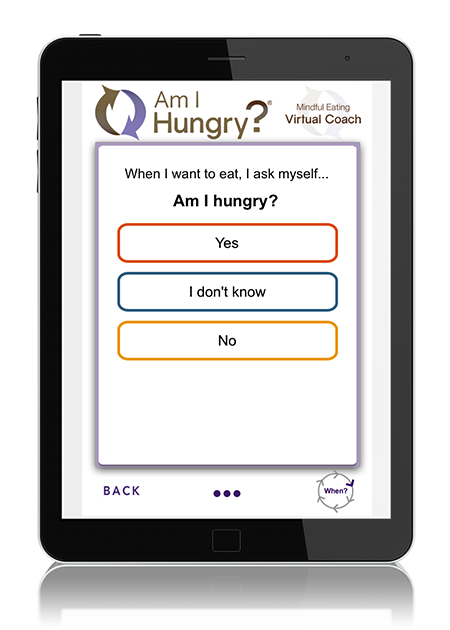 The Mindful Eating Virtual Coach is a powerful decision-making tool that guides users through the Am I Hungry? Mindful Eating Cycle. Unlike health apps that require the user to look up food items, log calories, or record activity, the Mindful Eating Virtual Coach is an “inside-out” approach to eating and physical activity. Whenever the user feels like eating, they simply click, “I want to eat” and the app will guide them through the mindful eating process step by step. They learn and practice mindful eating skills including how to identify signals of hunger and fullness, recognizing “head hunger,” using a series of questions for deciding what to eat in order to balance nourishment and enjoyment, and how to tune-in to the multisensory experience of eating. This app is also a companion to Dr. May’s book series, Eat What You Love, Love What You Eat for individuals struggling with yo-yo dieting, emotional eating, binge eating, diabetes, and/or who have had bariatric surgery. To receive a complimentary download of the app for an online review (value $2.99), please email training@amihungry.com with “App Review” in the subject line. Please identify your media outlet or blog and your preferred version, Apple or Android.